Melt butter in an 8x8 inch glass baking dish or small casserole dish. Add croutons and toss to coat. Sprinkle cheese on top of croutons. In a large bowl, beat together eggs, milk and dry mustard. Pour egg mixture over croutons and cheese. Sprinkle on cubed ham. Cover with plastic wrap, and refrigerate overnight. Preheat oven to 375 degrees F (190 degrees C). 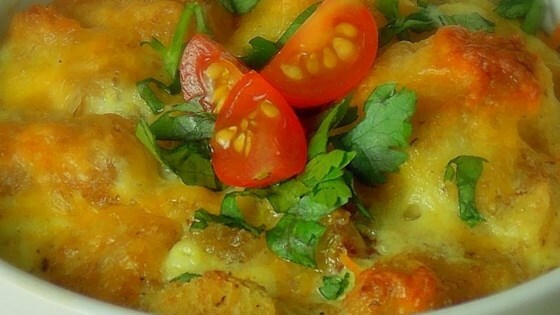 Let casserole stand at room temperature while oven heats. Bake in preheated oven for 40 minutes, until eggs are set. Let sit for 5 minutes before cutting. Can also be frozen and microwaved later. I have tried a dozen breakfast casseroles in the last month and this is just the one I was looking for. Taste Great! Simple! Wonderful!